Should a Marxist believe in human rights? L’idée d'allocation universelle semble gagner en crédibilité, tandis que les conditions politiques de sa mise en œuvre paraissent de mieux en mieux réunies. Parmi les justifications a son introduction, il y a la lutte contre la polarisation des revenus lies a la globalisation et l’atténuation des effets pervers lies aux interactions entre taxes et subsides. Ce papier avance l’argument selon lequel cette proposition devrait être associée a un mouvement social mondial visant a lutter contre le futur précaire des jeunes générations. 1At present the Basic Income (BI) proposal seems to be poised somewhere between academic dream and popular demand. Prototypes are being implemented in some developing countries; embryonic forms are detectable in some affluent ones; and a few social movements are adopting it as part of their manifestos all over the world. 2Although some advocates still guard the purity of its principles, we also witness the less edifying sights of the Iranian regime replacing its consumer subsidies by something like a BI in the face of economic stagnation and popular unrest, and Colonel Gaddafi dispensing an ad hoc cash version to his supporters in Tripoli while using military force against the revolutionary uprising in the rest of his country. As a global problem of employment and income for a whole new generation is emerging, BI can appear to be more of a sop than a solution. Does BI have respectable roots in democratic collective action, or must it remain suspended between utopianism and opportunism? 3My first encounter with the proposal was in the early 1970s, in a small industrial town in South West England, where I was a probation officer. At that moment structural unemployment was reappearing for the first time since the Second World War, and the demand for a BI brought together college drop-outs, influenced by the social movements of the late-1960s USA, Trotskyist trade union organisers made redundant by the local engineering factory, and indigenous long-term benefits claimants (single parents and disabled people). For those claiming social assistance for the first time, that undignified experience, together with the message that a new form of global capitalism was threatening the whole welfare state, supplied the motivation to join a movement (offering advocacy, participation and mutual benefits to members), which reflected the spirit of that turbulent age. The BI proposal fitted that movement’s mood, having arrived on the westerly wind blowing from America (Jordan 1973). 4After the radical moment of the early 1970s, neo-liberal political forces in the UK went on the offensive with the advent of Margaret Thatcher; the left took up its position in defence of the welfare state, and BI fell off the political agenda. Yet within a few months in 1984-5, I encountered three people who were to change the direction and trajectory of the whole campaign around the proposal. At that time, Guy Standing was already a globetrotting powerhouse, working for the International Labour Office in Geneva; I little thought when I met him at Exeter St David’s station that he would put his formidable energies behind BI. Philippe Van Parijs seemed a somewhat diffident young academic; it was hard to imagine that he would project BI into the mainstream of moral and political philosophy worldwide within the space of a decade. And Hermione Parker, a Tory grande dame with an overwhelming hatred of Thatcher, was scarcely the most likely influence on UK social policy, representing as she did the seemingly endangered traditions of Cobbett, Disraeli and Lady Juliet Rhys Williams (Parker 1989). 1 I had ghost-written most of his political testament, Citizens’ Britain (1988), a few years earlier. 5With the formation of BIEN in 1986, the campaign became first a European and then a global one. But for many years it seemed like an idea with an intellectual appeal, which kept winning over academics and the occasional political has-been, but which was incapable of firing the imagination of the new brand of activists. In the UK, Paddy Ashdown persuaded the liberal Democrats to go into the 1992 election with the proposal as one of its social policy commitments.1 The party did poorly, and the idea met with little enthusiasm on electoral doorsteps. 6So it seemed that the BI proposal was destined to drift from continent to continent, always finding a few willing souls to pick it up and run with it for a while, and often beguiling the most gifted and creative spirits, but never anchoring itself in the grass roots of an enduring set of social relations, or a coherent political programme. 7This view tended to be confirmed by Van Trier’s (1995) historical studies. BI as an idea was recognisable in almost every age since Imperial Roman times. It was the offspring of the Enlightenment, of the Industrial Revolution, of anarchism and utopian socialism. In the UK, it took the form of two very detailed schemes immediately after the First World War; but so hopeless were they at organisation and co-ordination that leading figures of these two strands (B. Pickard and J. Meade) were close friends and neighbours in Geneva without either even realising that the other was committed to the principle. Was BIEN itself little more than the expression of a similar political incompetence, a travelling circus destined to meet in attractive cities all over the planet, rallying the faithful to a flag that would never fly over so much as a municipal building? 8Since the turn of the century, BI seems to be casting off this fey and flitting guise; it has been adopted by hard-headed politicians at local and national levels, and there have been real pilot projects which have largely justified the claims of its advocates. Furthermore, although these experiments have taken place in far-flung and exotic places, the failures of traditional instruments of income maintenance and employment policy in the advanced economies mean that it is back on their agendas, though in a disguised form. 9The UK is a case in point. The Labour Party came to power in 1997, pledged to reform the benefits system and create new jobs throughout the economy, re-integrating the excluded poor by improving incentives (through a minimum wage and new tax credits) and enforcing work obligations (welfare-to-work counselling, training and sanctions). Ten years later, most of the same social phenomena which sparked these programmes remained. Four million new jobs had come into existence, but around 75 per cent of these had been taken by migrant workers, mostly from Poland and the other EU accession states of Central Europe, who did not qualify for outof- work benefits. The Conservatives pounced on these statistics, arguing that the benefits system trapped low-skilled citizens in claimant roles, and created a disorderly, demoralised underclass – the ’Broken Britain’ phenomenon. 10The scheme proposed by the Conservative-minded think-tank, the Centre for Social Justice (2009) was very similar to the one put forward by H. Parker in her Instead of the Dole (1989). Parker had argued for a partial integration of the income tax and means-tested benefits systems as a first step towards a fully-fledged BI. Without referring to any such goal, here was a government-in- waiting recommending a measure which would allow claimants to keep the full amount of their benefits up to the point where these could be withdrawn through the tax system, enabling a smooth transition from outside to inside the labour market. Although the assessment unit was to be the household, little was said about work enforcement; the scheme was consistent with a transition to the BI approach. 11Because of the fiscal deficit, this has not been implemented in full; benefit levels have been cut, and conditionality strengthened before the improvements in incentives take effect. But in the longer term, the reforms introduced do take the UK system for people of working age in the direction of a BI, by introducing ’universal credits’ to replace a wide range of means-tested benefits for people of working age, by raising the sums disregarded by the authorities for those working only a few hours a week, and by achieving a smooth trajectory of additional income as these hours are increased. Eventually the benefits regime seems likely to move towards more simplicity and less conditionality; indeed it is required to do so if the new government’s overall philosophy of the ’Big Society’ is to be made a reality. Since the declared aim is to involve all citizens in participatory, democratic activity, in groups and communities, involving paid and voluntary work, only a BI approach could include poor people in this form of citizenship and common good. 12However, the success of this strategy depends on a culture shift as well as a transformation in the UK labour market. In effect, the new coalition government has abandoned Labour’s Third Way attempt to create employment through a combination of investment in the ’knowledge economy,’ the expansion of public sector management and technical roles, and a growth in low paid service work, subsidised by tax credits and enforced by officials. This approach disguised the stagnation of middle-range and lower earnings by encouraging a massive growth in bank credit – before the crash, UK credit card holders owed around 75 per cent of this form of personal debt in the EU. This ’financialisation’ of citizenship under Labour created the conditions for the collapse of the UK banks. 2 Incidentally, Blond also gives a favourable mention to BI on this context on p. 32 of his book. 14But two factors threaten the emergence of any such ’Big Society.’ First, the sheer speed and scale of the budget cuts, and the immediate consequences of this for public and voluntary sector employment, is more likely to make people insecure and cautious about changing their work strategy and orientation than to enable a cultural transformation. But second, and in the long-run more crucially, there may simply be no scope for a sustainable growth in this form of economy; instead, it may turn out to be no more than a further fragmentation of the labour market, and an authoritarian system for managing economic decline. 3 BBC Radio 4, ’Economic News’, Today, 28 February 2011. 16Standing (2011) identifies a global 'precariat', a 'new dangerous class' of younger people, often with good educational qualifications, but facing long-term insecurity of income and employment, which spearheaded the uprisings in the Arab world. One risk is that these revolutions will lead to mass migration into Europe, and to anti-immigrant movements of the kind already evident in Sweden, the Netherlands and Denmark. Instead of uniting to demand the BI, the precariat might form the basis for a new fascism. 17So it is crucial that proposals for a transition to BI in the affluent countries take account of the risks as well as the opportunities of the present situation, and that advocates target the precariat for their support. In this regard, Japan is a good model; there Toru Yamamori has always focused on organising homeless and precariously employed citizens around BI. He was partly inspired by interviewing elderly former activists from the Newton Abbot Claimants Union of the 1970s on a visit to England. 18It is also very important that advocates convey a realistic version of what BI can achieve. Gone are the days when it can be represented as a panacea for humanising capitalism, and making it consistent with global justice; more credible would be the claim that it might be the last best hope of a dignified decline of the West in the century in which the East will rise to economic dominance. And we should not be too proud to acknowledge that several developing countries such as Brazil and Namibia have stolen a march on us in recognising the pragmatic advantages of BI for social harmony amid glaring inequality. 19The new global capitalism consists of a super-rich international elite, highly mobile between countries, and with few emotional or political commitments to any particular regime. In so far as a small proportion of any state’s citizens have strong links to this elite (for instance, those working in the City of London) these along get the full benefit of the plutocracy’s wealth. A dwindling proportion of what Standing calls ’proficians’ – skilled experts in various fields – are all that remains of the majority who once had careers and income security. For all the rest, BI offers their best prospect of developing a portfolio of activities in a reasonably planned and self-directing way, and of improving their collective environment in cooperation with others. 20In this respect, countries like Mongolia have recognised the future sooner than we have; the discovery of enormous mineral wealth means that the rich few must dispense BIs to yak herders, subsistence farmers and petty traders, to maintain the social fabric. In my role as a peasant (producing apples, not yak cheese), I can see that much of the UK economy already resembles the Mongolian one, though in a shabbier form, and little of it makes much longer-term sense. Occupations like clowning and obesity counselling are among the few still experiencing expansion; in the public sector, it costs ￡460 to cull each ruddy duck (to protect the Spanish white-headed one) and ￡1,200 to pay me the EU subsidy of ￡150 for my grazed orchard. Surely someone can show the young generation that BI offers a better way. ASHDOWN, P. (1988), Citizens’ Britain: A Radical Agenda, London: Fourth Estate. BLOND, P. (2010), Red Tory: How the Left and the Right Broke Britain and How We Can Fix It, London: Faber and Faber. Centre for Social Justice (CSJ) (2009), Dynamic Benefits: Towards Welfare that Works, London: CSJ. JORDAN, B. (1973), Paupers: The Making of the New Claiming Class, London: Routledge and Kegan Paul. PARKER, H. (1989), Instead of the Dole: An Enquiry into the Integration of Taxes and Benefits, London: Routledge. STANDING, G. (2011), The Precariat: The New Dangerous Class, London: Bloomsbury. VAN TRIER, W. (1995), Every One a King: An Investigation into the Meaning and Significance of the Debate on Basic Incomes, with Special Reference to Three Episodes from the British Inter-War Experience, Leuven: Department of Sociology, Catholic University of Leuven (KULeuven). Prospects for basic income: a British perspective In: Arguing about justice: Essays for Philippe Van Parijs [online]. Louvain-la-Neuve: Presses universitaires de Louvain, 2011 (creato il 20 avril 2019). Disponibile su Internet: <http://books.openedition.org/pucl/1819>. ISBN: 9782875581969. Gosseries, Axel, e Philippe Vanderborght, (dir..) “Prospects for basic income: a British perspective”. Louvain-la-Neuve: Presses universitaires de Louvain, 2011. (pp. 253-259) Web. <http://books.openedition.org/pucl/1819>. GOSSERIES, Axel (dir.) ; VANDERBORGHT, Philippe (dir.). 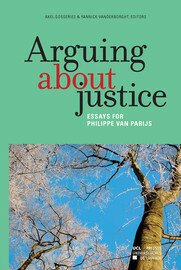 Arguing about justice: Essays for Philippe Van Parijs. Nouva edizione [online]. Louvain-la-Neuve: Presses universitaires de Louvain, 2011 (creato il 20 avril 2019). Disponibile su Internet: <http://books.openedition.org/pucl/1752>. ISBN: 9782875581969. Gosseries, Axel, e Philippe Vanderborght, ed. Arguing about justice: Essays for Philippe Van Parijs. Louvain-la-Neuve: Presses universitaires de Louvain, 2011. Web. <http://books.openedition.org/pucl/1752>.